One of the world's most popular clubs, the reigning English champions and Club World Cup holders, the "Red Devils" are one of the most successful clubs in the history of soccer. The world's leading children's rights organization works in more than 190 countries. As the guardian of the United Nations Convention on the Rights of the Child, UNICEF helps children realize their full potential. Together with partners, UNICEF delivers health care, nutrition, education and protection to children in urgent need, while working with governments to ensure they deliver on their promises to protect and promote the rights of every child. Now a new children's rights campaign has been jointly launched by United and UNICEF. Manchester United was the first football club to take the initiative in developing an active partnership between UNICEF and world of football. Manchester United Foundation CEO, John Shiels, said, "All of our players give willingly towards such courses, and have sent out very important messages towards every body, particularly, to the youth. The youth are our tomorrows. So it's really important that our stars are willing to stand out, willing to be courageous, and stand out and say, and do what's right." United for UNICEF was launched in 1999 and is the longest running collaboration between a premiership football club and a global charity. To date, the club has raised over ￡2 million to help 1.5 million children worldwide. Manchester United was one of the first corporate partners to sign up to support UNICEF's five year global children and AIDS campaign, Unite for Children Unite against AIDS. Manchester United donated 100,000 pounds to help fund an education program to prevent the spread of HIV/AIDS among young people in China. On all United's tours they take time out of their schedule to learn about the work of their global charity partner UNICEF and specifically their work to support children at risk of, and affected by HIV and AIDS. 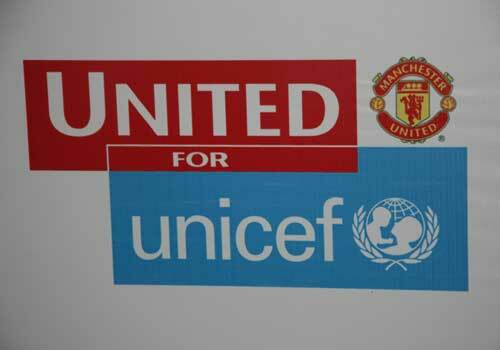 In 2005, United made a commitment to support UNICEF's global campaign Unite for Children, Unite against AIDS and they reinforced the commitment on their 2009 Asian Tour.